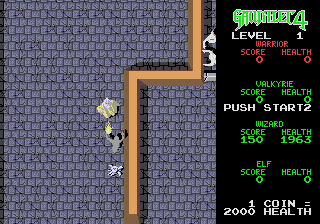 nasty uglies in the ultimate coin-op dungeon crawler. 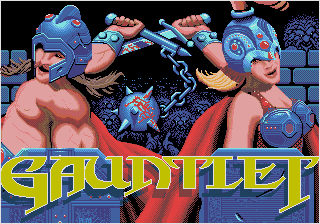 This is the only version of Gauntlet a person needs for any console. It isn't as fancy as the newer 3D ones on the other newer consoles. But it keeps the faithful arcade original feel. The graphics are dead on to the arcade and the sound is even better. The music tracks in the game simply rock! The RPG mode is the best part as it has you going back through the levels to access others higher up. I have still yet to beat this game. If you find this one, you need to grab it, simple as that. Simply the best gauntlet out there. If you can manage to get a tap, Invite 3 friends over and you wont be sorry! Quest mode does get really had so be careful. One of those perfect games for the Genny. All I can say about this game is that is one of the few arcade to Genesis translations that is actually BETTER than the original! With the new quest mode and the music soundtracks (both of which the arcade version lacked), this is definitely a game no Genesis owner should be without! A fantastic conversion of an all-time classic coin-op game! While sticking to firmly to its arcade roots, this Genesis conversion adds some new game types such as the excellent Quest and Record modes. The Quest mode adds a distinctive RPG flavour the game, with the heroes battling their way up various towers for gold and experience points. These points in turn can be used to increase abilities and buy new weapons/armour. However, the real highlight of this game for me has to be the music. Holy cow, what a soundtrack! In my opinion, this game has some of the best music ever to grace the Genesis format. 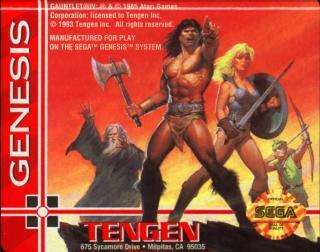 Overall, Tengen really outdid themselves with this one. 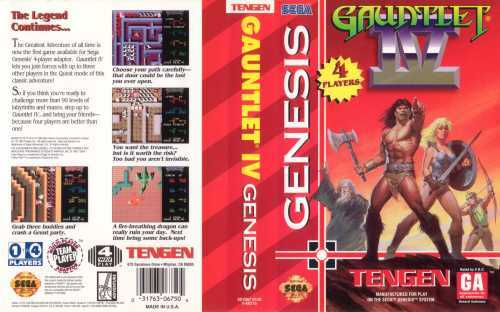 If you're looking for a Gauntlet conversion (on any platform), this is the one to get, simple as that. I have never beat this game its fun but its just too dang hard!!!!! !